The first fully-automated parking system in Chicago using proven, robotic technology and the only LEED Gold certified facility in the U.S.
Green Park Eco Garage provides a superior answer to the growing problem of parking in urban areas. Our solution is more than an automated parking garage -- it provides customers with peace of mind through a marriage of sophisticated technology, LEED certification, smartphone integration, shuttle service and in-location kiosks. We are the only company approved to design and build automated parking garages in the City of Chicago. Formed VLF Development LLC to provide premium living spaces in urban environments. 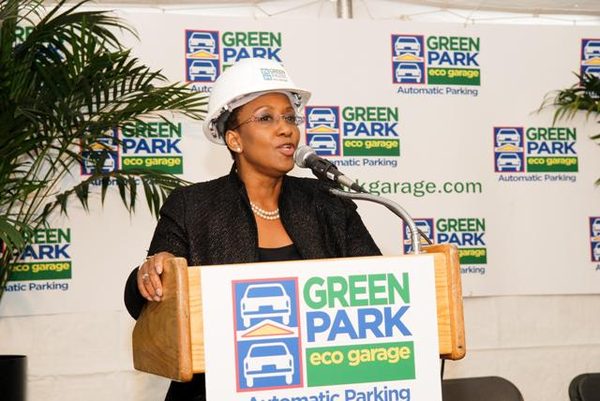 She spearheaded the development of Victoria Place, a luxury Chicago mixed use complex, and currently developing Green Park Eco Garage – an innovative, fully-automated and ecological parking system that will revolutionize the way America parks. Earned bachelor's degree from Roosevelt University and MBA from University of Chicago; also Certified Public Accountant. IBM Corporation veteran that was part of the original management team which established the first channel for Value Added Resellers and Value Added Dealers. He later joined US Robotics as strategic alliances manager to jointly engineer and market products with Microsoft, Cisco Systems and Sun Micro Systems, among others.